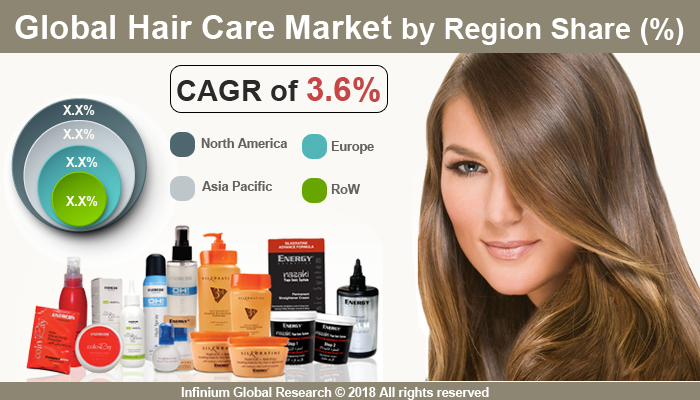 A recent report published by Infinium Global Research on hair care market provides in-depth analysis of segments and sub-segments in global as well as regional hair care market. The study also highlights the impact of drivers, restraints and macro indicators on the global and regional haircare market over the short term as well as long term. The report is a comprehensive presentation of trends, forecast and dollar values of the global hair care market. According to the report, the global haircare market is projected to grow at a CAGR of 3.68 % over the forecast period of 2018-2024. Hair care routines vary according to the physical characteristics of one's hair and an individual's culture. Hair care products include shampoos, oils, coloring, conditioners, gels, and sheens. These Hair care products help in protecting and nourishing the hair and reduce hair damage and also helps to control properties and behavior of the hair so that it can be retained and styled in a desired manner. These products also keep hair healthy by improving the texture and quality of the hair. Hair care products are made of natural or synthetic materials combined with other additional substances such as surfactants, emulsifiers, and preservatives. As per the types of hair and its requirement, different kinds of hair care products are available in the market and are used by hair care professionals in salons and by individuals at homes. These hair care products are used to remove environmental pollution, dandruff, dry skin particles, oils, and dirt. Modern hair care products deliver multiple treatments for damage such as dull hair, split ends, weak hair, rough hair, and dehydrated hair. Factors such as growing hair and scalp problems, growing demand for hair color products due to the increase in aged population, growing air pollution, and increasing hair-related problems attached with technological innovation in product manufacturing are some factors that are driving the growth of hair care market. Furthermore, advertising campaigns of hair care products, a growing number of fashion conscious consumers, and high perception of salon services across the world are also boosting the market growth. Besides, changing the grooming pattern, increasing expenditure on beauty and personal care products among male and female consumers are also increasing market growth. Moreover, the rising popularity of herbal hair care products is also fuelling the growth of this market. Additionally, growing consumer’s consciousness regarding hair care, attractive packaging, and shifting consumers preference are fueling the demand for this market. Several trends observed in the hair care market are rising popularity of hair care treatments such as hair spa, the growing number of new product launches, and growing focus on personal grooming are some of the latest trends for global hair care market. However, the high cost of hair care products is some of the restraining factors affecting the growth of the global hair care market. Among the geographic, U.S is anticipated to be the largest market for hair care in the North America region followed by the Asia Pacific and Europe. In U.S factors such as growing annual expenditure on hair care products such as shampoo, oil, and conditioner, increasing fashion consciousness consumers and shifting towards styling products, and attractive packaging is estimated to boost the market growth in this country. Moreover, the Europe region is driven by factors such as large multinational companies focusing on providing superior quality hair care products, and growing hair related problems among consumers. In addition to this, factors responsible for the growth of this market in Asia Pacific region is due to improvement in living standards, increasing hygiene consciousness, the presence of huge population base and increase in variation for hair care products. The report on global haircare market covers segments such as product and distribution channel. On the basis of product, the global haircare market is categorized into shampoos, styling gels, hair spray, hair oil, conditioners, and colorants. On the basis of the distribution channel, the global haircare market is categorized into pharmacies, e-commerce, specialty stores, direct selling, salons, and hypermarkets & retail chains. The report provides profiles of the companies in the global haircare market such as Johnson & Johns, Amway, Procter & Gamble Co., Unilever, L'Oreal Group, Avon Products Inc., Revlon Inc., NaturaCosmeticos SA, Kao Corporation and Church & Dwight Co Inc. The report provides deep insights on demand forecasts, market trends, and micro and macro indicators. In addition, this report provides insights into the factors that are driving and restraining the global haircare market. Moreover, IGR-Growth Matrix analysis given in the report brings an insight into the investment areas that existing or new market players can consider. The report provides insights into the market using analytical tools such as Porter's five forces analysis and DRO analysis of the hair care market. Moreover, the study highlights current market trends and provides forecast from 2018-2024. We also have highlighted future trends in the hair care market that will impact the demand during the forecast period. Moreover, the competitive analysis given in each regional market brings insight into the market share of the leading players. This report will help manufacturers, suppliers, and distributors of the hair care market to understand the present and future trends in this market and formulate their strategies accordingly.